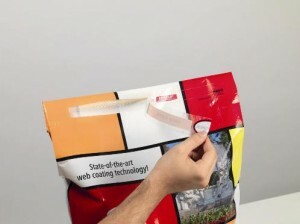 At interpack 2014, Starlinger & Co GmbH will present its sustainable packaging concept PP*STAR pinch-bottom bag.PP*STAR bags are made from a composite of polypropylene (PP) tape fabric and reverse printed OPP film. This makes them lightweight and at the same time durable and tear resistant, according to Starlinger. At the show, the PP*STAR bags will be shown in free fall to demonstrate their high strength and endurance. While other bags often burst when dropped – for example in the process of lifting them from a shopping cart into the car boot, Starlinger said a PP*STAR bag can fall off a shelf several meters high without breaking. Specially designed for packaging sensitive dry bulk goods for consumer use such as dog food, cat litter, or flour, PP*STAR bag protect its contents from external influences such as moisture or insects with good barrier properties. The laminated printed OPP film allows attractive design, even on sack bottoms and sides. Starlinger will also display a Flexible Intermediate Bulk Container (FIBC) made of 100% polyethylene terephthalate (PET) container fabric. In collaboration with SABIC, the division Starlinger textile packaging has developed a process for production of PET weaving tapes, characterized by high tensile strength coupled with low residual shrinkage and high creep modulus. According to the Austria-based machinery supplier, the high creep modulus enables FIBCs from PET tape fabric to maintain their shape and diameter even in long term storage. Depending on the contents, they can be stacked several layers high without tipping over. Their dimensional stability makes them a viable alternative to expensive types of bulk packaging such as octabins, which are used especially for free-flowing materials. Meanwhile, the Starlinger recycling technology division will exhibit the new C-VAC module that ensures high degassing and purification efficiency during the extrusion process. It can be installed as an add-on to all Starlinger extruders and guarantees high quality recycled material even from highly contaminated or heavily printed plastics. In addition, its PET sheet line viscoSHEET, developed by Starlinger viscotec, produces sheet for food packaging from up to 100% recycled PET. Processing rPET, virgin PET and Post-Industrial Regrind (PIR), the line produces sheet compliant with the prevailing US Food and Drug Administration (FDA) and European Food Safety Authority (EFSA) standards for food contact applications. interpack 2014 will be held in Düsseldorf, Germany from May 8-14.